Type 2 diabetes places a heavy burden on patients, families and communities. As a clinician, you have the ability to make a difference in your patients’ lives. The AMA is committed to helping you prevent type 2 diabetes in your patient population and improve their health outcomes. The resources available here will assist you in identifying your patients who are at risk for type 2 diabetes and managing them with an effective treatment. If your organization does not have a diabetes prevention strategy, the AMA has also developed an online experience to implement a system-wide strategy. Click here to obtain more information and to share this with your colleagues. The M.A.P. framework is designed to help clinical care teams and physicians accurately diagnose and effectively treat chronic disease. Initially developed by the AMA and its partners for use in improving hypertension control rates, the framework is organized into three domains that address and overcome major challenges associated with diagnosing and treating chronic disease. The challenges addressed by the M.A.P. 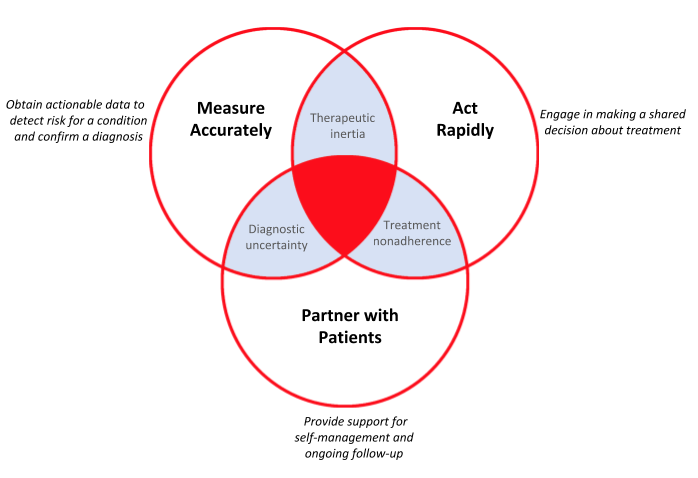 framework are diagnostic uncertainty (defined as lack of clarity as to whether a condition exists), therapeutic inertia (defined as failure to initiate or escalate treatment when patients have not met treatment goals) and non-adherence to prescribed treatment.